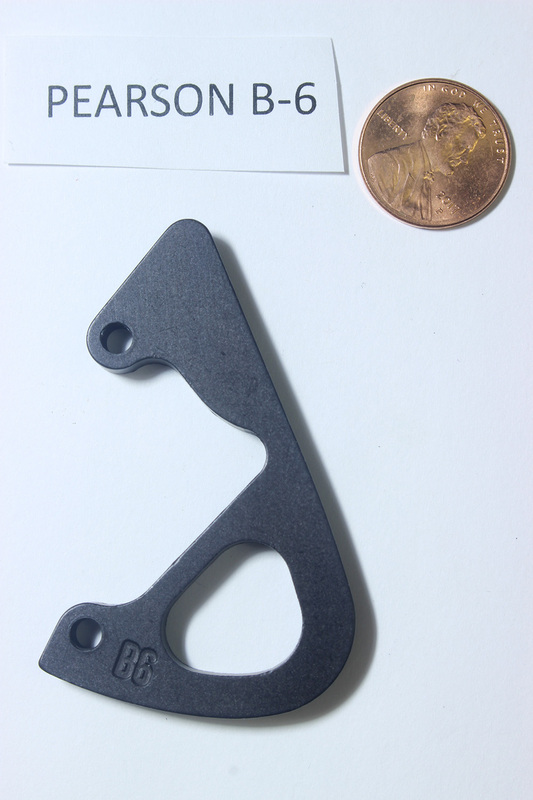 Home > YARD SALE > Modules > Pearson Archery, Cam Draw Length Module, Size B6, HARD TO FIND ITEM! Pearson Archery, Compound Bow Cam Draw Length Module, Size B6: Original factory draw length modules for older bows - HARD TO FIND! Modules may show minor anodizing blemishes, but are 100% functional. 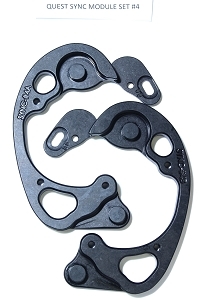 These obsolete parts are from old production work stock and are sold individually. No retail packaging. Sizing & Installation Note: Please refer to the bow manufacturer module charts for fitment. Over the years, some series of modules have been used in multiple bows - even across multiple brands. The only sure way to know what draw length a particular module will yield is to refer to the original specification chart for your model bow. However, most modules sizes represent 1 inch increments, with higher numbers yielding longer draw lengths and lower numbers yielding shorter draw lengths. For example, switching from a #4 module to a #6 module typically increases the bow's draw length by 2 inches ... but not always. Sometimes the numbering sequence works backwards. We know that's confusing, but as a general rule, the larger (physically) the module is, the longer the draw length it yields. 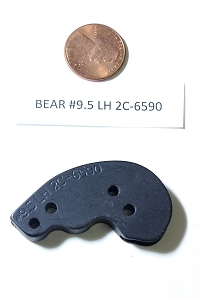 That's why we use the penny to give scale to our module photographs. If you are still unsure, please contact your bow's manufacturer before ordering draw length modules. Also note, some modules can be installed with just a simple hex wrench while others require some professional surgery (use of a bow press, corresponding adjustments of draw stop pegs, cable boss rerouting, etc.). 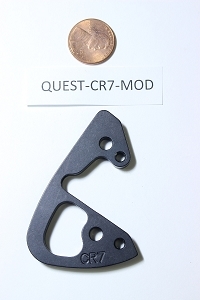 Quest Bowhunting, Compound Bow Draw Length Module, #CR7, HARD TO FIND ITEM! 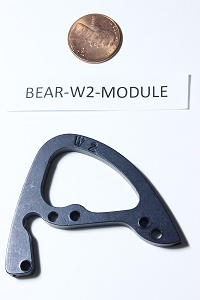 Bear Compound Bow Draw Length Module, Single Cam #W2, HARD TO FIND OEM ARCHERY PART! 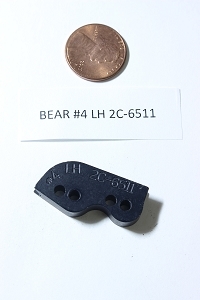 Bear Compound Bow Draw Length Module, Single Cam, #4 Left Hand 2C-6511, HARD TO FIND OEM ARCHERY PART! 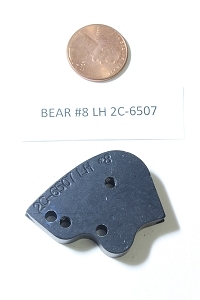 Bear Compound Bow Draw Length Module, Single Cam, #8 Left Hand 2C-6507, HARD TO FIND OEM ARCHERY PART! 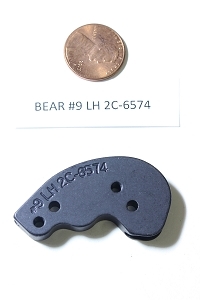 Bear Compound Bow Draw Length Module, Single Cam, #9 Left Hand 2C-6574, HARD TO FIND OEM ARCHERY PART! 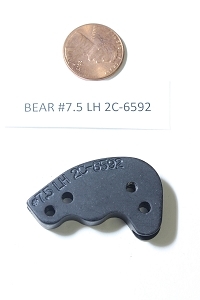 Bear Compound Bow Draw Length Module, Single Cam, #7.5 Left Hand 2C-6592, RARE COMPOUND BOW OEM PART! Bear Compound Bow Draw Length Module, Single Cam, #9.5 Left Hand 2C-6590, RARE COMPOUND BOW OEM PART!